With around 16000 inhabitants, the Greek island of Kalymnos is one of the most densely populated islands in the Dodecanese archipelago. Kalymnos is widely known as the ‘Sponge Diver Island’, and in former times sponge diving brought a certain degree of wealth to the island. Even today Kalymnos still counts among the most prosperous Greek islands, although the number of sponges was decimated by an epidemic in the 80’s and there are simply not enough sponges any more to make it a sustainable industry. People are still diving for sponges, but they do it for the sake of upholding the tradition and practise free diving for sponges as a sporting activity. Recently tourism on Kalymnos experienced a boost when the international rock climbing community discovered Kalymnos to be the ideal place for their sport. Due to the island’s steep rocks and its rugged character, rock climbing has indeed become one of the most popular sporting activities on Kalymnos. With its sheer rock faces and steep slopes, there is little greenery on the island and there is little variation in the scenery. Only in the region around Vathi are plantations cultivating lemon and orange trees that are worth mentioning. A holiday on Kalymnos is for those who like to explore, and to many visitors the island doesn’t reveal its beauty at first sight. Kalymnos does have a small airport, but the best way to get to the island is by ferry boat from Kos or Rhodes. Armeos is a quiet, family-friendly resort on the west coast of the Greek Dodecanese Island of Kalymnos, Rock-climbing enthusiasts love staying at the picturesque village of Armeos, as it is only a couple of miles away from the two most popular climbing walls on the island – the “Ghost Kitchen” and the “Arhi Wall”. The quiet little village of Emporios is situated in the north-west of Kalymnos. Emporios offers a combination of authentic Greek hospitality (Greek food, music and evening entertainment), beautiful scenery for those who like mountain walks and a sandy beach for water sports enthusiasts. 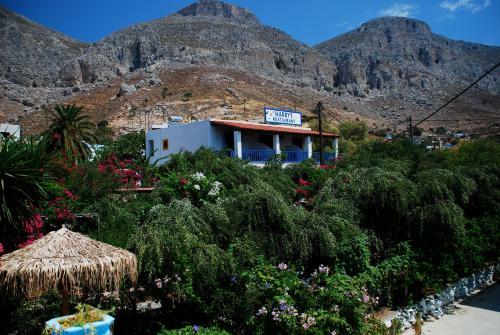 The coastal village of Masouri is the tourist centre on the west coast of Kalymnos, with plenty of hotels, holiday apartments and traditional Greek taverns serving fresh fish and local specialties. Perfect for rock climbing enthusiasts, Masouri also has one of the most popular beaches on Kalymnos offering a variety of water sport options. The small and idyllic coastal resort of Myrties on the west coast of the Greek Dodecanese Island of Kalymnos is typically Greek and unspoilt by tourism. With a picturesque little harbour overlooked by dramatic rocks and framed by a pebble beach with crystal clear water, Myrties is the ideal place for romantics. Pothia is the bustling capital of Kalymnos, with colourful houses, byzantine churches, a medieval castle and a large busy harbour, a fish market, numerous restaurants, bars and taverns and a nautical museum – a perfect place to visit during your stay on Kalymnos. The small natural harbour of Rina in the eastern part of the Dodecanese Island of Kalymnos belongs to the village of Vathys. Situated on the edge of a long, narrow bay, calm blue sea framed by sheer rugged cliffs, Rina looks stunning with its dazzlingly white houses and colourful boats. Rina is situated in a fertile valley with mandarin and lemon groves, a lovely contrast to the sheer rocks and the blue Aegean Sea. Accommodation is limited in this idyllic place, so those who want to book a holiday there can’t afford to wait. Not unlike an oasis, Vathys is situated in a fertile valley in the dry and mountainous region north-east of Pothia, the capital of Kalymnos. There are picturesque houses in “Mandarin Valley” that extends down to a romantic harbour on a fjord-like, narrow bay. Tourist accommodation, restaurants and taverns are to be found in the harbour region. Vathys doesn’t have a beach, but numerous pleasure boats take tourists to nearby beaches.